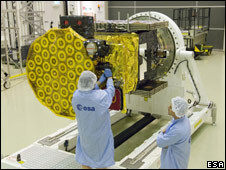 The next and vital step has been taken by Europe in its quest to set up the Galileo satellite-navigation system. EU transport ministers have approved the so-called Galileo Implementation Regulation. This is the legal instrument that releases the 3.4bn euros agreed by finance ministers in 2007 to fund construction of the space-based system. It means contracts can soon be awarded to establish ground stations, to build spacecraft, and provide launchers. Competition for those contracts should be closed by December, initiating work that ensures Galileo is up and running by the end of 2013. Galileo is envisaged as a rival to - but technologically complementary with - the American GPS (Global Positioning System). It is touted as a key high-technology venture for the EU. Galileo is designed to improve substantially the availability and accuracy of timing signals delivered from space. These signals already play a fundamental role - not just in navigation, but also in electricity distribution, the functioning of e-mail and the internet, and in the security of financial transactions and many other economic activities. Galileo's improved clocks are expected to deepen and extend this role. The better penetration, accuracy and guarantees of service promised by Galileo should also give many more entrepreneurs the confidence to build business plans around sat-nav, say supporters. The approval on Monday by transport ministers was a key step in making Galileo a reality following the debacle of trying to realise the project through a partnership between the public and private sectors. The consortium of European aerospace and telecom concerns invited to build and operate Galileo was effectively sacked last year by the European Commission when it failed to agree progress on the implementation of the programme. The decision to fund Galileo entirely from public taxes required the EU to re-allocate spare funds that would otherwise have gone to agriculture and research. "We will create new jobs and Europe will claim its rightful place side by side with the technologically most developed world powers." The 3.4bn euros (£2.7bn; $5.3bn) for the period 2007-2013 covers not only the funds required to implement Galileo but also Egnos, an "overlay" system of control and correction that improves the current GPS service received in Europe. The next demonstrator satellite for Galileo, known as Giove-B, is scheduled to launch from Kazakhstan at the end of the month.